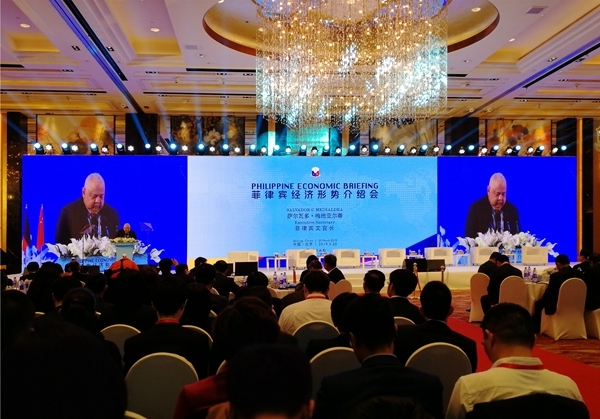 On 20 March 2019, at the invitation of the Embassy of the Philippines in China, Mr. Guo Chuanwei, Director of Trade and Investment Division of the ASEAN-China Centre (ACC), attended the Philippine Economic Briefing co-sponsored by the Philippine Government and the Bank of China. Senior officials of the Philippine Government including H.E. Mr. Salvador C. Medialdea, Executive Secretary,Mr. Carlos G. Dominguez, Secretary of Department of Finance, Mr. Diwa C. Guinigundo, Deputy Governor of the Central Bank, Mme. Janet B. Abuel, Officer-in-Charge-Secretary of Department of Budget and Management, Mr. Carlos Bernardo O. Abd Santos, Assistant Secretary of National Economic and Development Authority, Mr. Mark A. Villar, Secretary of Department of Public Works and Highways, and Mr. Arthur P. Tugade, Secretary of Department of Transportation, attended the briefing.The briefing was opened with welcome remarks by Mr. Sun Yu, Vice President of the Bank of China, and closed with remarks by H.E. Mr. Jose S. L. Sta.Romana, the Philippine Ambassador to China.Nearly 500 participants including representatives of enterprises including GT Capital Holdings, Jollibee Foods Corporation, CNOOC Gas and Power Group, investors from China and other countries as well as representatives of international organizations attended the event. Philippine Finance Secretary Carlos G. Dominguezstated that the Philippines has ranked among the fastest growing countries in Asia, and the government has actively created favorable conditions to attract foreign direct investment.The Philippine economy has a strong internal engine of growth and is confident to cope with the challenges brought by uncertainties in the external environment. Composed of keynote speeches and panel discussions, the briefing focused on the macroeconomic development and infrastructure planning of the Philippines and highlighted the fiscal and taxation policies, infrastructure projects and investment opportunities launched by the Philippine Government. The briefing aimed to attract more Chinese direct investment and help the Philippine economy achieve sustainable growth.